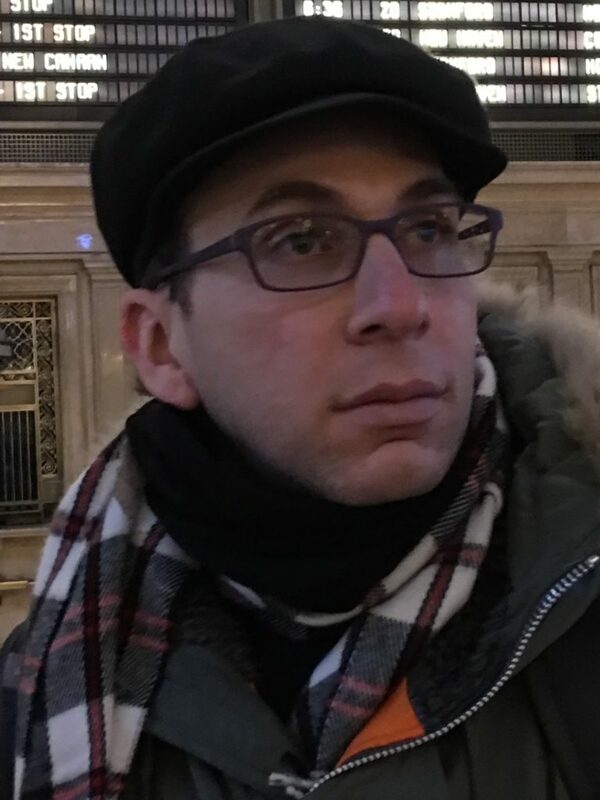 What’s up with Joshua Eli Kranz..LA Composer/ Performer? You Are MY Peach. 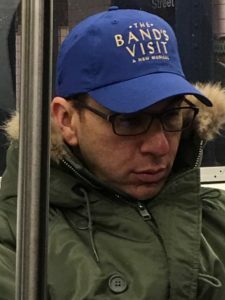 I’ve been to NYC over the last 25 years maybe 8 times. Each time seems new because it is. NYC is always remaking itself keeping what is old and that has character but finding new spaces to squeeze in or build something new. For a composer and musician there is really no better place than NYC. New Yorkers are a cultured lot. I have thought I could live there, but this people magnet out-prices all of us who are average and is too busy for the regular breathing of my soul. Please listen with earphones. You’ll enjoy it more. I decided to write a song for a spec job. It is a Diana Krall type song.. and wholly appropriate for February 14.. Valentines’s Day. I liked writing it and putting it down because the jazz genre is freeform and allows for innovation. Composing and lyric writing is a good fit for me because I can do things the way I want, and I enjoy doing it at the same time. That this song is jazz is why playing and performing the song fills my face with a smile. Once I discovered how good it makes me feel to play jazz, it is where I spend and have spent my time training. The spec job requirement was to write a sensual art song that uses food in the lyrics. It was to be performed by me in an intimate 60 person setting in a 5 star restaurant while a chef prepared food dishes ostensibly suggested by the song. In return my song and name would be ferried on social media. I liked the given prescription for writing the song and how it was to be used. The lyric ideas are not a 100% description of me but show that I am a flexible composer who can write for different view points. The song title: You Are My Peach. I just happen to love peaches. Here is the first verse: A sweet peach/ To sweeten my drink/As I knock back one or two/Is like the right woman I think/A special sweet sauce/With a bit of a kick. Then the chorus: Bring me a peach/Tickle my nose with the fuzz/Juicy and so ripe/Round with curves/Sweetness galore/Pulling me onto the dance floor/For a night of bliss/Sealed with a kiss/It’s you/You are my peach. So what do you think? The song had to be in C Major. No other key would do. It’s a 4/4 Jazz Bakery song or a couple improv seductive dance. In the lyrics there is a drink with floating peach shreds, a peach pie, an apple, peach melba originally concocted at the Savoy in London to honor an Australian soprano named Nellie Melba, and creme brulee, divinity, and peach liqueur. Those foods are perfect to sip and eat with your peach by your side. Every time I now eat a peach I am dreaming and waiting for my girl to pass into view so we can share some delicious moments. It is amazing how a marketing idea can elevate an entire class of food.. in this case fruit. So whether you like honeydew or pineapple or a tangerine that peels easily or slippery mango slices or tart cherries that cause your lips to pucker or melons that gush and are juicy or sweet strawberries bathed in fondue chocolate and whip cream etc. it is easy to see that a musical allure built around some tasty fruits can be very stimulating. I didn’t even have a peach in the house while I was writing the song, but I sure was stimulated to go get some. I thought I would work on this blog idea on my off-time while in NYC since I started writing it in Los Angeles. NYC is a diverse environment that inspires but it was not a good place for me to write. The NYC pace is exhausting. To write I need to relax. NYC is all about moving about and rushing. I like observing and then taking some time to think and feel. There is plenty to observe in NYC but it is not a place to relax and shut things out for a while. At the end of the short cold days and after sipping music and culture I was nothing but tired. Lots of people to thank: tohunbo.adewale123 from Texas for becoming a FAN after enjoying And Then You Were Gone..definitely one of my personal favorites because it is pure jazz. Yu-riNoda from Japan lined up behind That Makes You Beautiful And I Want You To Be and Work Moves Me On..both upbeat and positive and Hello, a terribly honest piece about real sadness. Thank you. Admin from California, definitely one of my devoted supporters, also listened to And Then You Were Gone and We Need To Live In The Arch Of The Rainbow. I am writing a choral arrangement for We Need To Live In The Arch…, a great song loaded with meaning! Joel361b in Michigan enjoyed She’s Got A Way and Life Is About What You Do With What Happens To You..two ends of the spectrum and then I Just Can’t. Kristy Cameron in the UK: she listened to A Game I Never Should Have Played Along With several times and I Am Happy You Never Stopped Thinking About Me and There Is No One I’d Rather Travel With But You. I appreciate that you focused on the honesty in my writing! Litsvaps@sengi.top “admired the lyrics” in Hanukkah in LA….she is still in the holiday mode. Religious freedom is always in vogue. And just as I was writing the finishing touches for this blog Samia Rabia in Algeria became my FAN after listening to Near To You Is What I Want, the first song I wrote for someone I once fell in love with. I am honored that you loved the song just a day before Valentine’s Day! Let me say once again, when you listen to my music, you encourage me to see and feel more and then write more. I am happy to be back home now. After returning from NYC I was tired but definitely more knowledgeable and sensitized than before I left. Please listen to You Are My Peach near the top of this blog. Have a nice Valentine’s Day and don’t forget to include some music. I studied tap dance when I was a young guy and still do. My teacher then was named Carol H. She loved Valentine’s Day more than all the holidays. She was warm and loving and very supportive. When Valentine’s day rolls around she is the first person that comes to mind. Valentine’s Day is a day to continue to tell and show important people how much you care about them, and she did that. Her students were important to her. She was very proud that I auditioned for a performing arts school and got in. She was dedicated.. not someone I could forget. Carol danced until she could no longer dance. *** I didn’t get the job, but I enjoyed writing a song that I probably never would have written… a hidden surprise. A kiss is the best Valentine present. 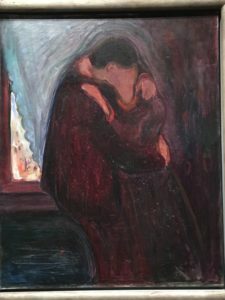 The Kiss by Edvard Munch at the Met Breuer. 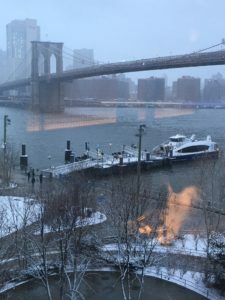 Below see the view of the Brooklyn Bridge from our room just after a late night snowfall. 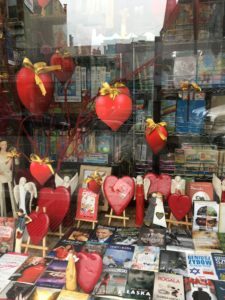 A Valentine’s Day window display in Polish Greenpoint. A cap I picked up to remember The Band’s Visit..a special musical that is sure to get people standing up. Posted on February 13, 2018 February 14, 2018 Leave a comment on What’s up with Joshua Eli Kranz..LA Composer/ Performer? You Are MY Peach.